The Blackfoot Broncos had a little too much of everything in Friday's Great 8 4A playoff football game against the upstart Wood River Wolverines. Blackfoot (9-0), seeking its third State 4A football championship in five years, whipped visiting Wood River (6-4) by a 41-13 score to advance into the quarterfinals at Skyview of Nampa (7-2) on Friday, Nov. 4. "We lost to a very good football team," said Wood River coach Kevin Stilling. "Blackfoot was a well-oiled machine with a lot of weapons." Outgaining the Wolverines 424-271 in total yards, the Broncos had too much passing (149 yards), too much running (248 yards), awesome special teams and unyielding defense. There was too much of senior quarterback Trae Pilster (11-for-18, 149 yards, 4 TD), too much of junior wide receiver Colby Pearson (6 catches, 74 yards, 3 TD plus a 23-yard TD fumble return) and too much of a swarming and quick defense. Pearson caught three Pilster TD passes in a 12-minute span during the first half to turn an early 10-0 Bronco lead into a 31-0 runaway just before the half. 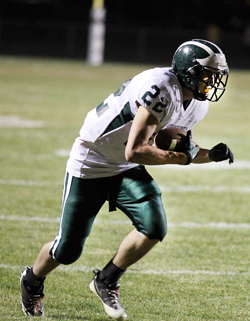 Wood River, which averaged 299 yards a game rushing, was limited to a season-low 147 and seldom broke free. Nineteen of 37 Wolverine rushes were for two yards or less. Stilling said, "Blackfoot didn't do anything differently against us than any other team did, like Minico. They were just better at it." All-time leading rusher Greg Lindbloom closed out his Wolverine career with 19 carries for 68 yards, bringing his season total to 193 rushes for 1,426 yards (7.4 yards per carry, 142 yards per game) with a school-record 21 TDs and 128 points. He scored in every game including a five-yard TD in the fourth quarter at Blackfoot. Lindbloom is the school's all-time top rusher with 283 carries for 1,863 yards (6.6 yards per carry). His was the lion's share of the team total of 2,989 yards on 413 rushes this season (7.2 yards, 298.9 a game). "Greg had an outstanding season," said Stilling. "But the biggest thing about our team this fall was—they all pulled on the same rope. Sometimes you just run into a better team." One offensive highlight for Wood River Friday took place in the final minute of the first half. After Blackfoot pulled ahead 31-0, senior running back Trace Tupper carried a right-end pitch for 25 yards behind a fine block by Lindbloom. A pass interference call drawn by senior receiver Austin Hafer moved the ball to the Bronco 25. From there junior quarterback Tommy Bailey rolled right and tossed his first TD pass covering 25 yards to Tupper along the right sideline. Wood River's final TD drive covered seven plays and 75 yards late in the fourth quarter—the big play a 38-yard option pass from Lindbloom to Tupper. Lindbloom dragged three Bronco tacklers across the goal line for the 41-13 final. At the end of the game, the sizable Wood River rooting section stood up and gave the Wolverines a standing ovation, and the players chanted "Thank you, fans," in unison before leaving the field. "I think, since the Twin Falls game, the kids responded and went out and played all four quarters of their final three games. They never quit and played hard. They jelled as a group. Hopefully, 10 years from now, they can look back at this year as the year that turned our program around." All three of Great Basin Conference teams lost in Friday's games. Hillcrest of Idaho Falls (7-3) won at previously unbeaten Minico (9-1) by a 27-20 score. Preston (3-6) beat Twin Falls (5-4) by a 28-21 count. Rushing—Greg Lindbloom 19-68, 5 1sts, 1 TD; Trace Tupper 7-52, 2 1sts; Austin Hafer 5-24; Ian Keys 4-6, 1st; Braxton Parish 1, -1; Tommy Bailey 1, -2. Passing—Tommy Bailey 3-6, 34 yards, 1 1st, 1 TD, 1 interception; Greg Lindbloom 1-1, 38 yards, 1 1st. Receiving—Trace Tupper 3-61, 1 1st, 1 TD; Braxton Parish 1-11, 1 1st. Fumble recoveries (1)—KJ Savaria 1. Kickoff returns—Ian Keys 4-49; Austin Hafer 1-16. All-purpose yardage—Trace Tupper 113, Greg Lindbloom 106. Tackles (68)—Austin Hafer 12, Drew Barsch 11, KJ Savaria 8, Greg Lindbloom 7, Braxton Parish 6, Chance Larkin 5, Ben Williams 3, Chris Carnes 3, Connor Farrow 2, Karel Kaiser 2, Colton Larkin 2, Jake Vegwert 2, Calub Castle 1, Connor Braatz 1, Joe McGonigal 1, Gus Conrad 1, Wyatt Griffith 1 . Rushing leaders—Ryan Gallegos 6-61, 2 1sts; Carlton Moore 9-56, 2 1sts; Trae Pilster 9-43, 2 1sts; Ryan Murdoch 6-39, 3 1sts; Kyle Haddon 4-20, 1 1st; Jake Denning 2-17, 1 1st; Colby Pearson 2-12. Passing—Trae Pilster 11-18, 149 yards, 6 1sts, 4 TD, 1 interception. Receiving—Colby Pearson 6-74, 3 1sts, 3 TD; James Korth 1-28, 1 1st; Gabby Maldonado 1-19, 1st; Cody Evans 1-12, 1st; Colton Dance 1-8, 1 TD; Jeremy Leavitt 1-8. Fumble recoveries (1)—Colby Pearson 1 with 23-yard TD return. Interceptions (1)—Colby Pearson 1 with 5-yard return. Sacks (2)—Kyle Parris and Austin Campbell 1-9; James Wislodoski 1-3. All-purpose yardage—Trae Pilster 192, Colby Pearson 114. Tackle leaders—Kyle Parris 9, Chance Jensen 8, James Wislodoski 7, Michael Windes 6, Ryan Gallegos 5, Dominick Smiddy 5, Ryan Murdoch 3. Note: Wood River also has a 2-point safety. Touchdown passes—Tommy Bailey 1, Austin Hafer 1. Conversion passes—0. Notes—Wood River scored in 30 of 40 quarters....Wood River successfully made 31 of 41 conversions (76% success rate)....Wood River scored 41 TD—37 on runs from scrimmage, 2 on passes, 2 on kickoff or punt returns, 0 on defense.